This is a guest post by Peter Smith: a Roman Catholic barrister practising in London. Thus, the Catholic bishops in England and Wales have spoken. The EU Referendum, they say in a statement, is about “the human person”: “We all have a responsibility to keep the dignity of the human person at the forefront of the debate. We must ask ourselves, in the face of every issue, what will best serve the dignity of all people both within Europe and beyond.” The bishops ask for every voter to examine his or her conscience before voting, and invite the voter to view the Referendum through the lens of Catholic social teaching. It’s that last invitation which is a little suspect. At first glimpse there’s nothing wrong with applying the core principles of CST – a concern for human dignity, the promotion of the common good, a preference for subsidiarity, and social inclusion or solidarity – to the UK’s continued membership of the European Union, exercising prudential judgment after an examination of conscience. What’s worrying is the way that the bishops have tried to steer the process of application. They point out that Europe has two millennia of Christian heritage. It does, but the EU can fairly be characterised as a force that opposes the cultural Christian legacy of Europe, contrary to the common good. 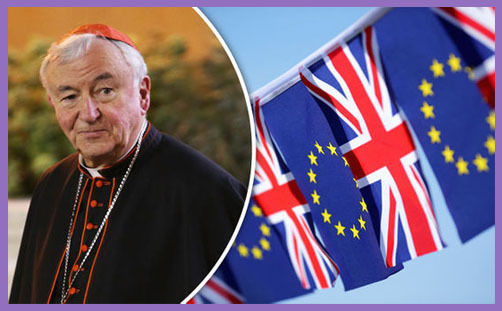 Take for instance the Eurocrats’ horror at the nomination of Rocco Buttiglione, the debate over the inclusion of God at the start of the preamble to the EU Constitution and, in Cardinal Cormac Murphy-O’Connor’s words, the “more general push towards secularisation” that the EU represents. The bishops remind us that “The coming together of European countries in the aftermath of a catastrophic war was designed to bind together former combatants and the contribution of the European project to peace in Western Europe should be recognised”. Whilst undeniably true that the European institutions were an effort to stop further conflict on the continent, they ignore the real question of whether it was the mere existence of the EEC (as it then was) which constituted that effort, or whether it was necessary to construct an “ever-closer Union”. The bishops dodge the question because, of course, the architects of the EEC – many of whom were Catholics, as is well-known – favoured ever-closer union. The bishops themselves side with this approach, which is masked by a cheap appeal to solidarity: “we are called to be generous and welcoming to all others, especially the most vulnerable”. What, then, of subsidiarity, the making of decisions at the level closest to those subject to the effects of the decision? Although a formal commitment to the principle was introduced in the Maastricht Treaty, it has been long-ignored as the ugly sister (if not banished brother) of integration. Unsurprisingly, the bishops mention but ignore the principle in their statement, as it stands in head-on collision with solidarity and with the common good as the bishops formulate it (and see, on this point, the Catholic interventions before every General Election since 1997). The EU is not a free trade area but a customs union. In the application of the four freedoms that stand as the pillars of the Union, there are no barriers between member states – but there are high walls to keep the rest out. This includes the goods, services, and capital generated by billions of people in Africa, Asia and Latin America, and of course the migration of those people themselves. The net result is that the poor are condemned to a lifetime of subsistence or hand-out. Surely this is an affront to human dignity of such gravity that it conclusively answers the bishops’ question? More Under: Africa, Cardinal Cormac Murphy-O'Connor, Catholic Bishops' Conference of England and Wales, Catholic Social Teaching, Christian heritage, Common Agricultural Policy, Common Good, Constitution for Europe, Customs union, EEC, EU, EU Referendum, Europe, Ever closer union, Free Trade, Freedom, Human dignity, James Cleverly, Maastricht, Peter Smith, Poverty, Rocco Buttiglione, Roman Catholic Church, Secularity, Solidarity, Sovereignty, Subsidiarity, Who is my Neighbour?